If you drive along Hwy 99 through Corvallis’s “South Town,” you might have a hard time imagining how the landscape looked when European settlers arrived 150-plus years ago. But if you can mentally erase the asphalt and power lines, the strip malls and subdivisions, you might start to form a picture of that long-ago landscape. Back then, South Town was a wetland. The triangular lowland was snugged between the Marys and the Willamette, its wet-prairie vegetation — camas, toad rush, tufted hairgrass, coyote thistle — spreading southwest to the riparian forests of the Marys and its tributary Muddy Creek. When the Marys flooded its banks, as it did several times a year, the overflow coursed across the prairie, forming channels and rivulets throughout the drainage. One of those natural channels caught the eye of an early entrepreneur, prominent Benton County businessman J.C. Avery. He had plans for that waterway. When staking out Avery’s land claim in 1845, the surveyor labeled the channel a “mill race.” What had long been an ephemeral channel, a seasonal “ditch” that filled with water during high flows (giving refuge to fish during flooding) and dried up in the summer, suddenly became a business asset. The channel officially became the Mill Race, turning the waterwheel that powered Avery’s saw mill at the confluence of the Marys and the Willamette near the current site of Hollingsworth & Vose (formerly Evanite Fiber Corporation). “Water flowing down a ditch from two miles up the Marys River provided the power that gave South Corvallis its start as an industrial center,” wrote Corvallis historian Kenneth Munford a 1991 edition of the Gazette-Times. Eventually, the saw mill gave way to a grist mill and then became a thriving, three-waterwheel flour mill owned by H.F. Fischer. A crew of Chinese laborers was hired to deepen and straighten the channel and to build an earthen dam across the Marys River about two miles upstream, near today’s Marysville Golf Course. The dam — which washed out several times over the years — “created a reservoir to keep constant the flow of water through the mill race,” Munford wrote. Today, the Mill Race travels from its source in the Marys, under roadways and railroad trestles through a series of culverts, its banks hardened by concrete or snarled by blackberries and other invasive weeds, returning, finally, to its mother river just before it empties into the Willamette. The Council is working to piece together the story of the Corvallis Mill Race. If you have information to share, please contact the Watershed Council online or call 541-758-7597. On an overcast Saturday in March, I met up with Dave Eckert at the South Co-op for a first-hand look at the Corvallis Mill Race. Eckert, who leads the Water Action Team of the Corvallis Sustainability Coalition, had contacted the Council a few weeks earlier to say, “Hey, how about doing a story on the Mill Race for your newsletter?” My reaction was, “What Mill Race?” When I learned that it’s a 160-year-old urban channel running smack-dab through the center of South Corvallis, I wanted to go see it for myself. Eckert led the way. From the co-op, we walked through the BMX Park on S.E. Chapman, where kids on dirt bikes zoom up and down packed-earth hummocks. Along the eastern edge of the track, a riparian corridor was growing thick with willow and underbrush, blocking the view of the stream from above. Holding onto a length of nylon rope that we had anchored to a tree, we half-slid down a steep embankment tangled with Himalayan blackberry. I saw deer tracks in the mud at my feet. At the bottom of the thicket ran a thin, brown trickle. This was the last leg of the Mill Race, which begins in the Marys River near the Cub Scout Lodge at the end of Allen Lane and, after flowing about two miles, re-joins the mainstem Marys just before it enters the Willamette at Shawala Point. Next we headed upstream toward the headquarters of specialized glass-fiber manufacturer Hollingsworth and Voss, the very spot where the Mill Race originally powered a sawmill in the 1800s and later drove three waterwheels for Fischer Flouring Mills. We skirted around the factory’s chain-link fence and then dropped again to the stream bank south of the plant. 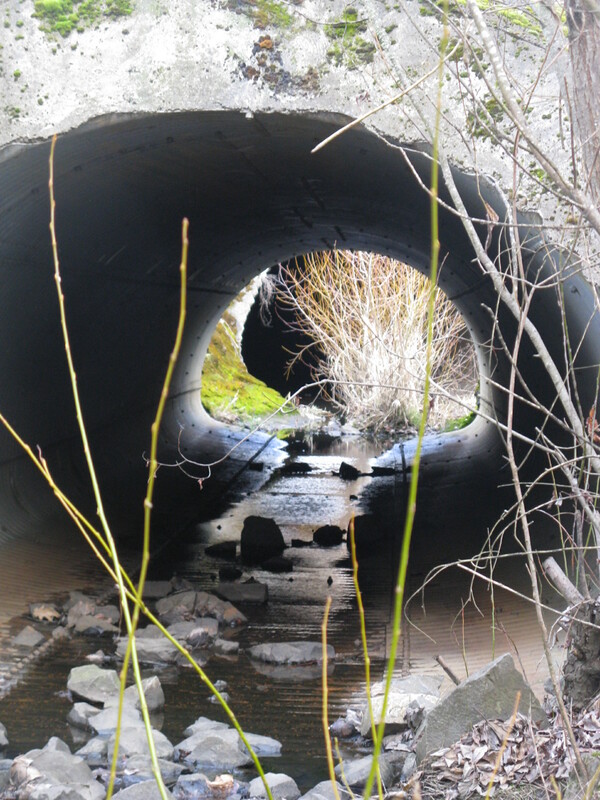 We could see the stream flowing through rusty culverts under the roadway. On the banks, wild roses grew, their red hips bright against the dull day. Where Crystal Lake Drive crosses the stream, duckweed choked the bed. The Corvallis Mill Race has a colorful history. Dug along an existing marshy stream corridor in the 1800s by Corvallis town father J.C. Avery, the stream (sometimes dismissed as a “ditch”) was devised to divert water from the Marys River to Avery’s sawmill on the Willamette River. To keep the flow constant, a dam was built on the Marys. Later on, Chinese laborers deepened and straightened the channel to power a flour mill. Today, both the dam and the mill are gone, but the Mill Race remains, passing under roads and rail lines in south Corvallis, then through the Hollingsworth & Voss industrial site (formerly Evanite). The original Mill Race drained directly into the Willamette, but several decades ago Evanite diverted its final segment into the Marys. Colorful history aside, the Mill Race goes mostly unnoticed as it flows through South Town. A torrent during the wet season, a trickle during the dry, it wends northeast from its headwaters near the Marysville Golf Course, passing through residential neighborhoods and commercial zones before rejoining the Marys not far from the Willamette. Most drivers cross the Mill Race on Hwy 99 without giving it a glance. A few scientific studies have been undertaken by local governments over the years, but the literature on the Mill Race remains thin. In short, the Mill Race has been nearly invisible and, except when it was realigned in the mid-1980s, mostly ignored in the modern era. But there’s a groundswell of interest bubbling up in the community. Homeowners who live along the stream are wondering about its water quality: Is it safe for kids to play in on a hot summer day? Nonprofits, including the Watershed Council and the Corvallis Sustainability Coalition, are seeking historical and contemporary information about vegetation and wildlife habitat, including fish passage and spawning. Watershed activists are puzzling over the Mill Race’s role in the storm water that sometimes floods the highway. Local businesses, graduate students, river ecologists and environmental writers are investigating the stream’s ebbs and flows, both literally and figuratively. Residents — tired of the trash that spoils the stream and mars the view — are organizing grassroots cleanups (see below). Together, they are envisioning a cleaner urban stream — one that is safe for kids and pets and supports native foliage to stop erosion, shade the banks and cool the water for native fish. They’re exploring the feasibility of interpretive signage and trails. And they’re continuing to ask questions, for example: How many undocumented effluent pipes empty into the Mill Race, speeding up flow and volume during flood events? What is the cultural heritage of the stream to the First People of the region? What role does the Mill Race play in occasional flooding along Hwy 99?